Our Teal Team is made up of six staff members from different departments, all of whom want to find ways for the Center to be as ecologically responsible as possible. Current Teal Team members include Laura Bahl, Henry Burke, Jeremy LeClair, Sarah Toupin, Allan Waterfield and Andrew Weaver. The team’s newest initiative was to install water bottle filling stations at both of the Center’s water fountains this winter. 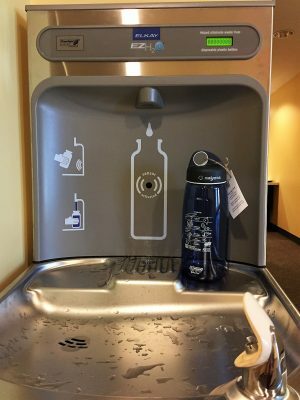 They provide a convenient way for visitors and staff to fill up their re-usable water bottles, and will discourage the use of single-serve plastic water bottles. A digital counter at each station displays how many plastic water bottles have been saved based on how many times bottles have been re-filled. With hundreds of campers and 80,000+ visitors in the building each year, we know these water bottle filling stations will get lots of use. As an additional way to promote the use of reusable bottles, SSC has custom-designed 24-ounce Nalgene bottles featuring sea creatures for the Center’s 25th anniversary year. These bottles are on sale in the Nature Store for $15 each, and every purchase supports the ocean education efforts of the Seacoast Science Center.